The tiny Coquina shell is found all over the Florida beaches (it’s the small shell in the photo below), but they are usually busy digging themselves back under the sand each time the waves wash over them. They can be found in many pretty colors and I have only one…because they were so numerous and I wasn’t very interested in collecting them. See a nice picture at this link. 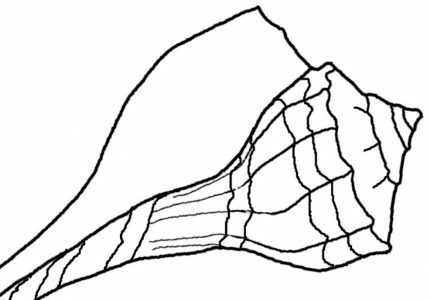 Shown here with two Turkey Wing shells, the little coquina shell was used in building material and many structures were built in Florida using it. The famous fort in St. Augustine, Castillo de San Marcos, is an example. Read more about the fort and the coquina used to build it on this page and other structures built totally or partially with coquina rock. I had a large “rock” of coquina in my yard which I used as a decoration, since Florida is devoid of “real” rocks – unless they’ve been imported.